Home » Hashkama #53 ~ Sparrows—are they a curse or a blessing? The Bible talks about sparrows— Jesus said, “…not a single sparrow can fall to the ground without your Father knowing it.” (Matthew 10:29) One winter in 1958 an ‘estimated’ 194, 432 sparrows were killed in one day, in one area alone. Across the whole nation the sparrow population was decimated with millions of birds dead on the ground. Without the sparrow population the bugs they once fed on thrived. The locust population spiralled out of control along with the grasshoppers. Famine followed as the insects devoured the crops. There was even discussion about having to import sparrows from the Soviet Union. It took decades for the species to recover. What happened to cause this catastrophe? The country was China; the leader was Chairman Mao. Acting on a false premise, Mao went to war against China’s great enemy, the sparrows. His claim to the lack of grain was that the sparrows were eating too much of it. Mao, in his great wisdom, mobilised the population of China to kill off the foe causing so much woe. The plan required ruthless coordination. With weapons that were going to cause mass destruction at the ready, the whole country, young and old, gathered to launch a simultaneous attack. Mao was getting rid of the bird that gave him the bird, and the humble sparrows didn’t stand a chance. Far too late in this war of birds, the regime came to realise that the sparrows were not pilfering pests making off with the harvest. In fact they came to the realisation that the sparrows were vital to the food chain, and were a necessary ally in dealing with Bugs & Co. When leaders get things wrong it isn’t just the wildlife that suffers. There is human suffering too. In China’s case there was famine and hardship. The sparrows were not a curse, they were a blessing! World leaders around the globe are acting on the false premise or presupposition that there is no God. The decisions they are making are leading the world into the scenario we read about in the book of Revelation: famine, hardship, misery, fearfulness, poverty, slavery, disease, war, financial collapse, destruction and tyranny. There will be natural disasters, earthquakes, volcanoes, super-storms and men’s hearts fainting for fear of what is coming upon the earth. (Luke 21:26). We are not there yet but we are on that super-highway to hell on earth. Because in their minds there is no God and no absolute truth, the world reinvents history, as the Palestinians are doing today, indoctrinating their children with false information, shaping their minds to hate Israel and the Jews. They have even reinvented themselves into being a people and nation who were not a people or nation; and the world turns a blind-eye! There have been and are Christians that reinvent the Scriptures making the Jews the enemy of Jesus and the Cross. Such Christians today line up with Islam and the Palestinians against the Jews and against Israel and are therefore libelling God whose Son was born a Jew. Jesus lived and grew up in Israel keeping to the customs and laws of the Jews and studying Scripture through Jewish eyes, culture, and understanding. He kept the Biblical Feasts and even those such as Hanukkah that are not Biblically based. While the Palestinian leadership continues their campaign of hate against Israel and the Jews, The EU leadership is ecstatic in its support and encouragement of the Palestinian cause. Not having recovered from Europe’s worst economic crisis in recent memory, and European citizens still struggling financially, the European Parliament (EP) has just decided to raise Europe’s aid to the Palestinians by €100 million – 30 percent more than previous years. The EP has awarded the Palestinians a pay rise of an additional €18 billion over the €129 billion cap imposed by expenditures-wary EU member states. Among the additional line items is that extra €100 million for the Palestinians. An extra €100 million might seem trivial compared to an overall budget of €147 billion for 2012, but it cannot be ignored that this is money the EU can ill afford. Moreover, the EU is pledging taxpayer money at a time when there are no guarantees it will be spent responsibly. No doubt much of it will disappear into the Bottomless Pit Bank Account. The Palestinians celebrated by sending dozens of rockets as well as mortar rounds which were fired from the Gaza Strip last Wednesday at southern Israeli towns. If they are angry they bomb Israel. If they are happy they bomb Israel, if they are being just plain Palestinian they bomb Israel. It was also on Wednesday that Britain’s Prime Minister David Cameron broke silence by making a speech of ‘peace in our time’ as he outlined the potential benefits of peace while on his first visit to Israel. Cameron said Britain fully supports the efforts of US Secretary of State John Kerry to forge a peace agreement between Israel and the Palestinian Authority (PA) and endorsed Kerry’s formula of “mutual recognition of the nation state of the Palestinian people and the nation state of the Jewish people.” Whatever promises Britain makes to Israel in the way of support, we should keep in mind the fact that Britain is a member of the European Union that opposes Israel and supports the Palestinian Authority. On Thursday David Cameron took his peace message to the Palestinian president Mahmoud Abbas, telling him that peace in the Middle East “is certainly possible”. Cameron also met with that dark shadowy presence that lurks in the Middle East, the peace envoy Tony Blair. Blair is seeking to drive forward the Initiative for the Palestinian Economy. His visit to Israel is his 114th since he was appointed as the Quartet Middle East envoy in 2007. Blair’s mandate as representative of the Quartet – the UN, US, EU and Russia – is to promote economic growth and job creation in the West Bank and the Gaza Strip and support the institution-building agenda of the Palestinian Authority. His economic mandate is inextricably intertwined with the peace process since issues such as road closures, communications and trade are central to the Palestinian economy. He has also been trying to enable large-scale Palestinian investments in the technology and housing sectors. A question put to Blair was whether Wednesday's missile attack could knock the peace process off track. In his reply he stated: “The strikes from Gaza just underline and illustrate the depth of the problem. “Gaza continues to be under lockdown, with extremist groups operating and the people in a desperate situation. One thing we are going to need, medium and long term, is a completely new strategy towards Gaza. In 2009, Zaki admitted on Lebanese TV that the ultimate goal of the two-state solution was the downfall of Israel. The Palestinian authority is not just a Holocaust denier; it is also an Israel denier. The land of Israel has always been the land of Israel, and Israel has always been the home of the Jews. The fact that the Romans called Israel Palestine and persecuted the Jews does not alter that fact. There has always been a Jewish presence in Israel. Zaki is acting on the false premise that Allah is gathering the Jews together in the land of Israel so that the Palestinians can kill them. That is a big mistake to make. The God of Israel spoke through the Prophets centuries ago about these days. It is the God of the Jews that is preparing the way for Yeshua HaMashiach to return to His people in the land He gave to them. No amount of hatred or wars will prevent that happening. God will dwell in the midst of His ancient people, and that day is drawing ever nearer. The followers of Islam make the presupposition that Allah is greatest. They consider the God of the Jews and Christians to be nothing. Islam fights from strength. It goes along in weakness until such time as they feel they are strong enough to conquer, and then they go to war. It is important to understand that Islamic peace therefore is really a state of war. It is a preparation for things to come. They believe their God is greatest and so they cannot lose. The Palestinians and Iranians goal is to destroy Israel. Their vitriol against Israel and cursing of Israel is well known. Israel has dealt with these things in her history. The writing on the Merneptah stele is in hieroglyphs and very clearly mentions the name of Israel on it. 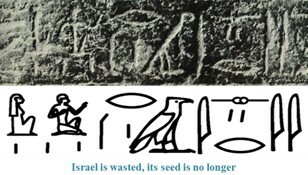 Israel was considered by the Pharaoh of Egypt important enough to mention as a significant victory. The Hebrews had conquered the land of Canaan around 1400 BC. The period of the Judges was a dark time in Israel's history because they had continually forsaken the Lord and served other gods, and there was continual turmoil in the land of Israel. The discovery of the Israel Stela is very important in the study of Biblical Archaeology. It is the oldest evidence for the existence of Israel in the land of Canaan in ancient times outside of the Bible. After the Antichrist has gathered the nations of the world together; in a plan of ruthless coordination aimed at annihilating the Jews. When its armies and weapons are amassed, Christ will wipe them out and the world will know that the Jews were not the cause of their woe. The discovery will come too late and will seal their fate. All the fighting, vitriol and cursing against the Jews will fail because the God of the Jews is not such a weakling that He cannot protect His people. The curses against Israel will fail. They will not come to rest on Israel. Balaam could not curse Israel even though he tried. The story of Balaam can be found in Numbers 22—24. They are pertinent Scriptures for today, particularly for those ‘Christians’ that are opposing Israel. Balaam was blind to God and it was the actions of his donkey that saved his life. ‘Christians’ opposing Israel, are wilfully opposing God Himself – “The donkey saw me and turned away from me these three times. If it had not turned away, I would certainly have killed you by now, but I would have spared it.” (Numbers 22:33). Quite a few years ago Margaret needed surgery. She was admitted to a ward named ‘Chirpy Sparrows.’ All the patients on the ward were either waiting for surgery or were recovering from an operation. Like Margaret, the patients had suffered great pain and discomfort, but with surgery recovered and entered into a full life again. Israel has known great pain and suffering but with God’s protecting hand Israel prevails and lives, and Israel will reign with their King. At this season of Purim (Esther 9:21-23) we remember Israel’s deliverance from the horrible Haman and the ancient Persian’s in the reign of king Xerxes (483-473 BCE). The Deliverer delivered Israel from the claws of death. While the various enemies of Israel have passed away, Israel lives and thrives. On October 16th, 1946, ten Nazi officers were executed as a result of the Nuremberg Trials. The Eleventh committed suicide hours before he was due to be hanged. The similarity between the Nuremberg Trials that took place after WWII and the biblical “Purim” account in the book of Esther when Haman’s ten sons were hung, have been remarked upon by others. The Purim story, according to the Talmud states that Haman also had a daughter who committed suicide, which meant that as she was already dead she did not need to be executed. After the Nuremberg Trials, Herman Goring, who was a well-known Nazi cross dresser, committed suicide by swallowing cyanide he had concealed in a copper cartridge shell, while lying on a cot in his cell, this just three hours prior to his scheduled execution and therefore did not need to be hanged. Israel’s God and Great Physician ensured their survival when He told them He would carry out surgery to remove their hearts of stone and would give them a transplant and a new heart (Ezekiel 36:25-27). What is coming and what Israel has a part in will be the real and genuine, and not the coming New World Order that will usher in chaos and disorder, and not the fake sheiks-on-the-make that are lining up to reign today—rather it will be Jesus, King of Kings reigning on earth. We will end with a final look at Chairman Mao and his legacy. Mao was born on December 26th, 1893 and he died on September 9th, 1976. Mao reigned from 1949 until his death in 1976. Professor Frank Dikotter, of the School of Oriental and African Studies at the University of London wrote a book, “Mao’s Great Famine.” He was awarded the 2011 Samuel Johnson Prize for non-fiction. The book makes grim but necessary reading concerning this era of world history and China in particular, as it details the abject failures of communism and the terrible human cost of that pernicious ideology. The book speaks about the disastrous famine that overtook China’s millions, and was the direct result of blind political dogma backed by centralised control and totalitarian power. Common sense was thrown out of the window, alongside any respect for humanity. I have mentioned before that we show what we think of God by the way we treat His image. Mao had no regard for God’s Word and introduced his own bible which contained The Thoughts of Chairman Mao. It was known as his “Little Red Book.” ‘Revolution is not a dinner party,’ was one of Mao’s profound thoughts, one of those many thoughts that filled the famous Little Red Book beloved by radical students and trendy intellectuals in the West in the Sixties. Whether or not Mao’s ‘thoughts’ were food for thought or not, the Chinese people themselves went hungry. They were left, in the words of a much older Chinese aphorism, to ‘eat bitterness’. Because of Mao’s industrial revolution the farmers were dragged from their farms to work out Mao’s dreams of Utopia. As a result, crops rotted in the soil causing a food shortage. The suffering of those deprived of food was horrendous. In some villages, a tenth of the population died in a single month. Some ate the straw roofs of their houses and the cotton padding of their winter clothes. They soaked and softened the leather of chairs until it was edible. They ate plaster from the walls, and when nothing else was left, people ate mud. One report Dikotter found in the party archives described shrivelled peasants and children with ribs visible through their skin scrambling into deep pits to carve out handfuls of porcelain-white mud. They mixed the mud with chaff, flowers, weeds and water, kneaded it into mud pies which they then baked. Though devoid of nutrition, the mud pies stopped the hunger pangs for a while but blocked up the intestines and bowels. Dikotter found evidence of many punishments including those for offences as small as digging up a potato. In all, he estimated 2.5 million people were beaten or tortured to death. Youth was no excuse. A 12-year-old boy was drowned in a pond like a kitten for stealing food from the communal canteen. Another report mention that after a boy took a handful of grains, his father was forced to bury him alive. Atrocities abounded, far more than I can go into here. Back in November, 1994 Gong Xiaoxia was a graduate student at Harvard researching her own history. She recalled the blank expression on the man’s face as he was beaten to death by a Chinese mob. He died without a name, becoming another statistic among millions. “I remember him so vividly, he really had no expression on his face,” Gong said. “After about 10 or 20 minutes, God knows how long, someone took out a knife and hit him right into the heart.” He was then strung on a pole and left dangling and rotting for two months. The most terrible things were permitted, inhuman activity by humans against humans, but I will finish with just one more quote from Gong Xiaoxia, and then a reminder from the Hebrew Scriptures concerning Israel. Peoples and Nations of the world, God said that all nations would be blessed through Abraham, and therefore through Abraham’s seed (Genesis 18:18; 22:18; 26:4; Isaiah 61:9; Jeremiah 4:2). Israel is not a curse, and Israel is not the enemy; Israel is a blessing! Don’t repeat the mistakes and failings of history. Mao attacked the sparrows and brought famine and suffering on his people. The nations attacking Israel will bring destruction upon themselves.